5.3 Can a survey using tokens ensure anonymous responses? Create email templates for invitations & reminders. Once the survey is switched to Closed-access mode (you need to create a survey participants table first for the respective survey), only the people that provide a unique token code (that has not been already used) can access the survey. If you enable the Allow public registration option from the Survey participants table panel, the survey participants will be able to register for your survey by receiving an automatically generated token code. Some tokens-related settings are stored in the participant settings panel. perform certain actions to more than one entry. The second row of the table includes various criteria that can help the survey administrator sort the entries. 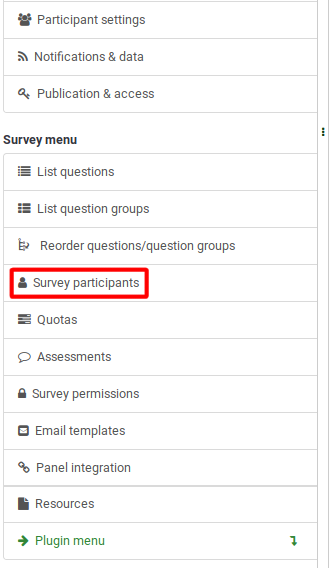 If you click on any of the columns/criteria from the table, the screen will be refreshed, showing the survey participants ordered in accordance to the criterion you just clicked on. Click twice on it to get the results displayed in a descending order. View this person in the central participant database: An icon will be displayed if the respective entry can also be found in the central participant database. Note that the Add survey participant panel is made of two tabs: the General tab and the Additional attributes tab. The additional attributes tab offers you access to your custom attributes - read the following wiki section for more details. Hint: To obtain a full list of token field names, export an existing survey participants table. Filter duplicate records: If enabled, you can set which fields are used to identify duplicates. By default First name, Last name & Email-address are preselected. If a duplicate is found while importing, the related line is omitted. 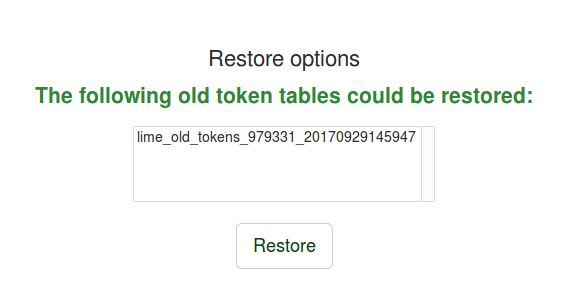 A common error when users try to import tokens is an invalid CSV file. This is often caused by Microsoft Excel. Many users have a list of email addresses saved as an XLS document. A file can be saved as CSV in Excel, however, depending on the locale of the OS, Microsoft Excel may use semi-colons (;) as comma separator, while a standard CSV file uses commas (,) as separators. If you do not know which one you use, open the file with a standard text editor and check what separator was used. Recommended free raw text editors are: PSPad, NotePad2 or Notepad++ for Windows, and TextWrangler for Macintosh. Duplicates are identified by First Name, Last Name & Email-Address. If a duplicate is found while importing, the related line is omitted (unless you have unchecked the Filter Duplicates checkbox). You can skip the survey participants for which the email status field is different from "OK" by enabling the Bypass token with failing email addresses option. Sometimes you might want to send invitations again to certain survey participants. 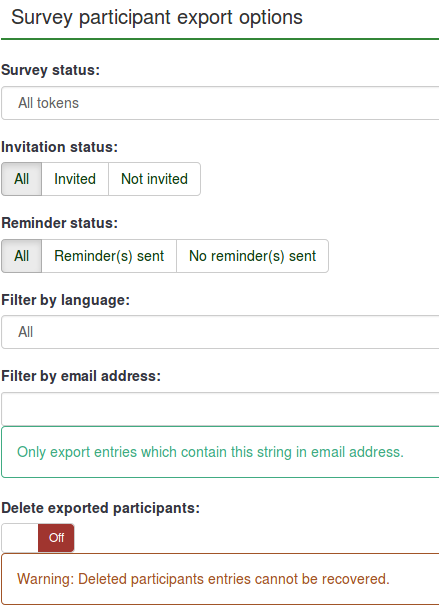 When you use the send invitations function, only email addresses that has not previously received an invitation will get one. This means that if you add new addresses to the survey participants list after the first time you sent invitations, only these new addresses will receive an invitation the second time you send invitations. This means that you can also edit an email in a particular table entry from where you got a bounce from and then send to only this edited address. Just turn off the Invitation sent field and then click send invitations again. Bypass date control before sending email: skip those entries that are not in the time-frame within which they can be used. 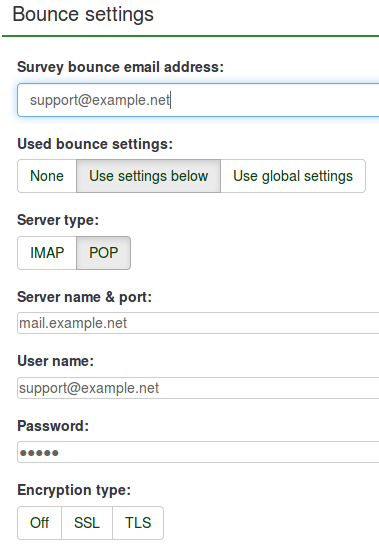 When you have to send a lot of emails at the same time, LimeSurvey will only send the first batch of N emails (this threshold is set by the administrator from the email settings, located in the global settings of your LimeSurvey installation). 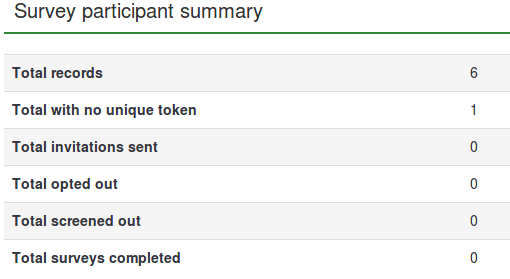 If you are using tokens and a participant fills out the survey, a confirmation email is sent to his/her email address. If you don't want this message to be sent, just deactivate this functionality from the general settings of your survey. Click on the following link for more information on how to correctly configure this feature. You may want to open your survey to the public but utilize the sort of respondent control available when using tokens. To do this, if you initialize your survey participants table and choose to allow public registration in the main survey setup (this setting can be later changed from the participant settings section that is located in the settings menu of the survey), people who visit your survey's URL without a token will be given the opportunity to register. To protect your survey from robot registrations, a CAPTCHA feature can be activated for all the registrations, save, and load forms. For more details, read our wiki on participant settings. The answer to this question is yes. Tokens can be used both for anonymous and non-anonymous surveys. This is determined when creating a survey. If a survey is not anonymous (or 'tracked') then the token list can be used to find the responses that an individual has made to the survey. If the survey is anonymous, then no link (technically: foreign key relationship) is available between the respondents from the survey participants table and their corresponding answers. Sometimes you may need a large number of fake e-mail addresses and tokens. You can use functions in a spreadsheet (e.g. OpenOffice Calc) to generate them. Let's assume you want thousands of addresses in a form: 1@test.com, 2@test.com, 3@test.com, and so on. Type "1" in A1. Insert function =A1+1 in A2, then copy A2 down as many times as you need so that you obtain a list of consecutive numbers. In B1 use the concatenation function to join A1 and "@test.com", which is =CONCATENATE(A1;"@test.com"). Then copy B1 down so that each A cell has a correspondent (you can also generate similarly fake names). 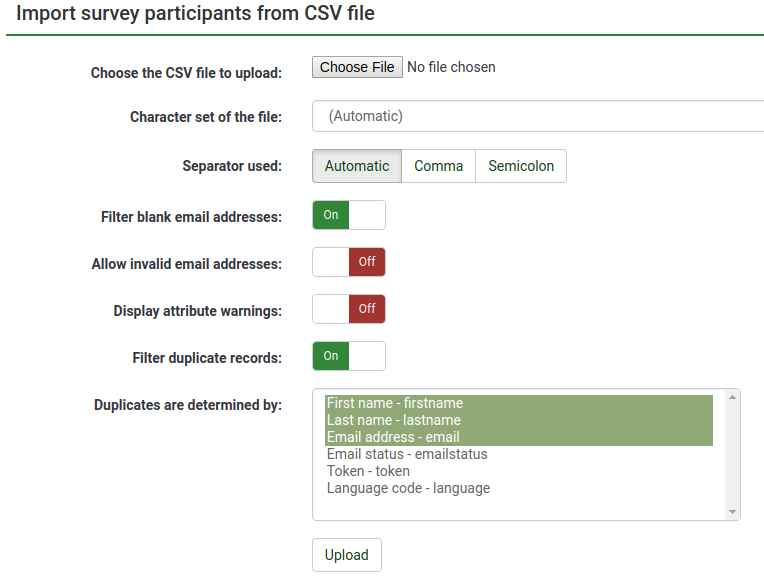 Finally, save the file as CSV in order to import it to LimeSurvey. This page was last edited on 12 February 2019, at 15:44.